I played around in my time machine again this weekend and tore a photo from Star Magazine to bring back and show you. Here we have a paparazzi photograph of Britney Spears and Kevin Federline taking their bouncing bundle of joy out for a stroll in the Hollywood Hills. Baby Sean Preston appears to be foaming at the mouth and has stained his face, hands and $800 designer warm up suit with sticky orange Cheeto goo. Mommy Britney looks a bit grossed out by the mess while Daddy Kevin looks on with detached amusement. Britney has just given Kevin a brand new $28,000 watch and he enjoys showing it off while guzzling his 64 oz Big Gulp. I bet there's Orange Fanta inside that enormous cup....this family appears to enjoy consuming things that are bright orange. Medium: Ink and acrylic on board, digital color. 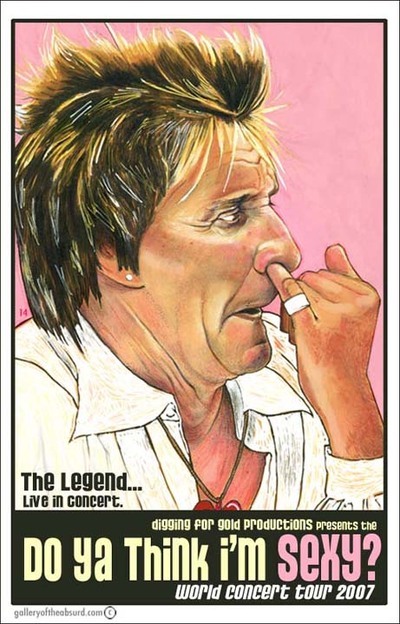 Rod Stewart was caught picking his nose by those sneaky papparazzi lurking in the bushes, so I thought it would make a terrific tour poster design. Medium: acrylic on board. I spent most of my weekend engaged in time travel. I always kick myself when I forget to bring my digital camera along, but this time I slipped it in my pocket. Traveling through so many hyperdimensional wormholes can really wear a girl out, so I thought I'd stop and get some coffee. The only place open in Los Angeles in the year 2025 was a seedy bar on Sunset, so I walked in, sat at the bar and saw Tara Reid sitting at the other end. I snapped her photo and figured I'd share it with you. Medium: ink on paper.